ComTrans is the behavioral health and social service transportation provider of choice in the communities we serve. We accomplish this by making a difference every day in the lives of our clients and our employees. ComTrans was founded by Neal Thomas in 1995 with a fleet of three vehicles. The idea to establish the company came about when a member of his own family needed help finding transportation—but could find none, and Neal realized that there was a lack of options within the Phoenix-area behavioral health community to transport seriously mentally ill (SMI) patients. When he also learned that SMI patients were often unnecessarily strapped to gurneys and transported in ambulances, he knew that there was a gap in the variety of appropriate transportation options for this niche population. ComTrans and ComCare, the company responsible for the Maricopa County behavioral health system, formed a strategy to staff crisis transport teams with emergency medical technicians. These EMTs worked to relieve police and fire departments by transporting passengers to and from urgent care centers, detoxification facilities, domestic violence shelters and hospitals. The first ComTrans vehicles were staffed by two-person crisis teams. Within months, police departments, fire officials and ambulance companies became strong advocates of the ComTrans model because of the resulting improvements in patient outcomes and cost savings. Consequently, that service line grew quickly. 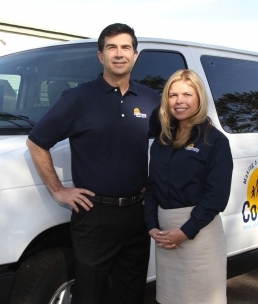 In 2000, ComTrans expanded its model to include additional services to the Arizona Department of Child Protective Services for cases in which passengers needed more care and attention than could be provided by traditional taxi services. This contract soon grew, and ComTrans began providing non-emergency transportation services for adults and school-age students who were covered by behavioral health organizations. ComTrans has grown steadily since 1995 in a manner that has consistently been the result of finding an opportunity to meet an unmet need. And in 2016, had the opportunity become a part of AMR, the leader in the emergency medical services sector which is known for implementing and providing the industry’s best practices. This relationship gives ComTrans tools to further improve the resources and services provided to the community.